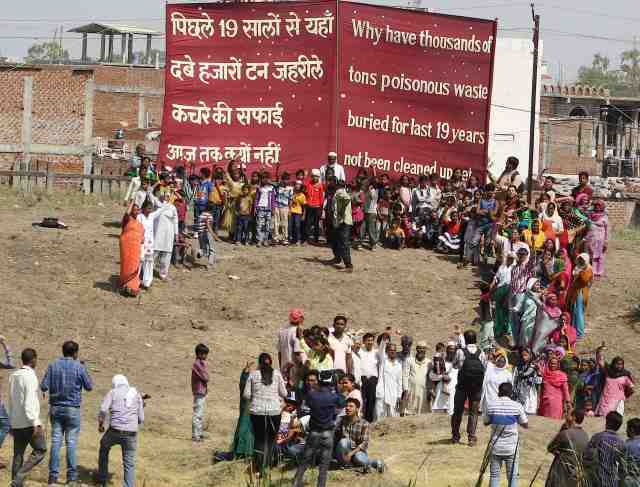 Residents of Bhopal gather atop the mound overlying the hazardous toxic waste with the banner asking when will the toxic mess be cleaned up and forming a big concerning question mark. The Bhopal Gas Tragedy, one of the worst industrial disasters that India has witnessed till date, took place on the night of 2nd December 1984 in the Indian capital city of Bhopal in Madhya Pradesh. While the cause of the disaster has been kept under debate, it is largely accepted and believed that the Union Carbide accident took place due to poor maintenance of the industrial plant which so as to avoid the cost of maintenance and prevent expenditure made for making the industrial plant safe for its workers and surrounding population. Twelve years later, in 1996, several thousand tons of hazardous waste from the Union Carbide pesticide factory was buried under mounds in the vicinity of the abandoned factory by the factory management. The waste is known to contain chemicals that cause cancers and birth defects and damage the liver, kidneys, lungs and the brain. In October 2012, the Lucknow based Indian Institute of Toxicology Research (IITR) had reported that the groundwater in 22 communities with 10,000 resident families is contaminated. According to them further tests have shown that the contamination has spread beyond 22 communities and it will continue unless the buried waste is removed from the site. On this World Environment Day, residents from the neighbourhood of Union Carbide’s abandoned factory in Bhopal demonstrated against the Government’s failure in removing thousands of tonnes of poisonous waste since the last 19 years. “It is Union Carbide that buried the waste next to our homes. Why is the Indian government not able to make Union Carbide’s current owner Dow Chemical accept legal liability and clean up the toxic waste?” asked Rashida Bee, President of the Bhopal Gas Peedit Mahila Stationery Karmchari Sangh. Balkrishna Namdeo of the Bhopal Gas Peedit Nirashrit Pensionbhogee Sangharsh Morcha condemned the Environment Minister’s recent refusal to seek help from the United Nations Environment Programme (UNEP) for a comprehensive scientific assessment of the depth, spread and nature of contamination. He said that without such assessment, no clean up could even begin. “The saddest part of this second disaster in Bhopal is that it is finding new victims every day while Government agencies that are supposed to protect our health and lives stand by doing nothing.” noted Safreen Khan of Children Against Dow Carbide.